Well this past week wasn’t the best in terms of running and I’m honestly kind of disappointed in that fact. I don’t really have any worthwhile excuses, the runs just didn’t happen. I did, however, work out almost every single day so that’s a positive. I’m linking up with Tara again and sharing my week of workouts. Read on and join in on the fun! Monday I tackled Pure Barre. I was a bit sore from Sunday’s race so I tried to really make sure to work my calves and stretch a bit longer. It felt kind of good to have ran hard enough to be sore the next day. Tuesday was another Pure Barre day. I was planning on running but just got busy and like I said, no excuses it just didn’t happen. Wednesday I tried out [solidcore] and it was a really great workout. I’ll be sharing more about [solidcore] soon but suffice to say that it was definitely a TOUGH workout. I also went for a good after work run with Julie. It’s always fun to run with Julie and we had lots of Bachelor news to catch up on. PS – did you watch the finale? How lame is it that there is going to be two Bachelorettes?? Very, in my opinion. Thursday and Friday were both Pure Barre days. I felt like I’d pulled something in my left hamstring and it felt really good to stretch it out. Saturday I spent the morning spectating the Rock N Roll marathon. Unfortunately it was pouring all morning and I was quickly freezing so my morning run after spectating was shelved in favor of warming up. I did head out for a quick run later that day. Sunday was a super busy day full of church, meetings and a friend’s birthday dinner. I thought I might have time between my meeting and my dinner to fit in a run, but no go. Considering I hadn’t had a total rest day since I could remember (seriously, I worked out every day two weeks ago and every day this past week except Sunday), I didn’t feel too bad about taking one. Overall, while I didn’t run nearly as much as I wanted to, I was active almost every day and took my first rest day in two weeks. I’m up to ten Pure Barre classes in 15 days and anticipate taking at least four classes this upcoming week – I’m well on my way to my goal of 20 for the month! I can’t feel bad about not getting in all the runs I wanted and I don’t (okay, maybe a little). This week, however, I’m back on the saddle and happy that I got some great running related news this week. Also on Saturday, some of the DC Oiselle gals are doing a trail run and I’m SUPER excited about it. Linking back up with Tara – go check out her blog! i did an 8 mile long run yesterday to prep for the Cherry Blossom 10 miler. My whole week of running was out of whack for some reason. Every single run felt so much harder than usual, not sure what’s up. I haven’t been overtraining, I hydrated well, stretched. I run every other day so my body gets a rest. Will just keep tweaking things. Can’t wait to get to DC!! The blossoms may actually be blooming during the race this year, which hasn’t happened in awhile! Some weeks are better than others, but you certainly are getting in alot of classes. I ran my longest training run for Boston yesterday, 20 miles and it was hard! 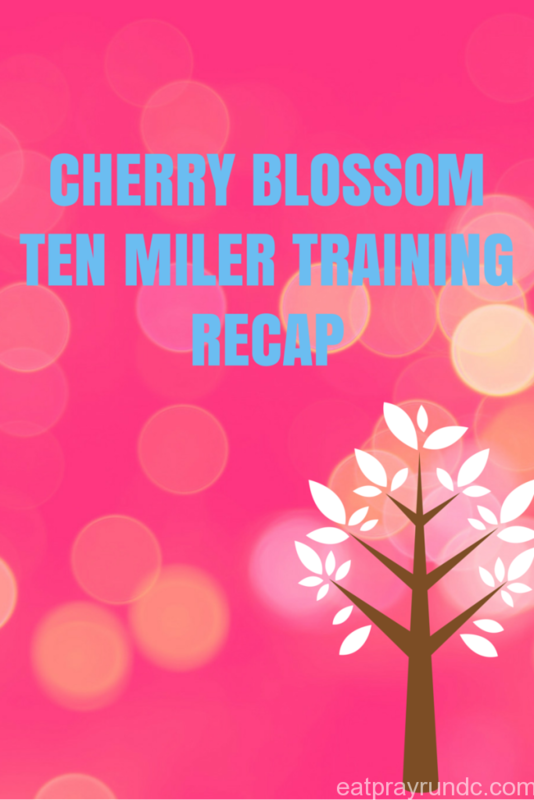 Pam and Christine recently posted…20 Mile training run thoughts, over 3 hours of brain drain! Woohooo!!!! Glad you made it through!!! Sounds like you had a good week of recovery though. Sometimes that’s more important after a race than shake out runs. If your muscles were tired, stretch them out and rest. Hopefully that means you’ll feel great this week. Thanks Lesley. You’re right this past week was probably exactly what I needed! with all the Pure Barre classes and throwing in the Solid Core workout (which I have to try, it’s literally a block from my house!) you can’t feel bad about not running. That’s a whole lotta active! Mar @ Mar on the Run recently posted…Shamrock Half Training Week 12: This is It! Thanks friend. You would love solidcore! First class is only 19.
oh I’m gonna do it, as soon as I find the time! That’s a lot of Pure Barre! Do you feel like it’s making you a stronger runner? Yeah 100%! It’s strengthening my core and my upper body like crazy! I follow you on Instagram but have never commented on your blog. From the bottom of my heart, THANK YOU for coming out on spectating on Saturday. You are a braver person than I am! I was out there running and I was so so grateful for all of the spectators who came out in such MISERABLE conditions to cheer us on! Congratulations on getting into the 17.75! It’s a really fun race! I wanted to enter but I’m also doing Cherry Blossom and this is my first season coming back from injury, so I didn’t think that 3 long-ish distance races in 6 weeks were the best idea. I live pretty close to Pure Barre and have been wanting to try it out! Courtney, I can’t wait to hear about Solidcore; I read on Sue’s blog that y’all were there together, which makes me happy, and she said it was crazy tough! This is the first I’ve heard of it, so I’m excited to hear more. You’re such a trooper for hanging with all of those poor, wet, cold runners at Rock ‘N’ Roll – sheesh. What a day, right? The weather has been crazy, but I think it’ll get better.I’m so jealous that you and the Oiselle gals are going on a trail run this weekend – y’all are going to have a BLAST! Thanks so much for linking up with the blog and I hope you have a great day! SOunds like a good week. Mine, not so good. I have a houldr injury that is really impeding any workouts I want to do, hoping I get some help from the ortho this week. I would say you still had a great week of MOVING!! 🙂 I’m definitely working on moving more throughout the week. Nice to see you are enjoying your pure barre so much I wish i liked it. Maybe I should try it again. Congrats on getting into the 17.75 big things ahead for you! Thanks Lauren! Yay for barre!!! I ran tonight and it felt great! For once I hit all my runs last week but it was the strength and swim (one each instead of two) that suffered. I love that you go to Pure Barre so much! Fun! Sometimes a week just plays out like that…but seriously all those Barre classes are no joke! Hope this week’s a good one! Yeah, I definitely needed that rest day 🙂 thanks Michelle – hope you have a great week, too! Did you get to the RnR race expo? I went to the one in Vegas in November and it was fabulous! Have a great week. Don’t be too hard on yourself for not getting all of your planned runs in. Life happens, and missing one here or there isn’t going to have a huge impact on your training in the long run. Totally true. I ran tonight and it was pretty speedy – definitely no loss of running fitness! You had a rocking week and kicking it at Pure Barre. I’m looking forward to hearing about Solidcore. My friend Rach was telling me about it – they have a studio by the new Pure Barre studio in Cathedral Commons. Oh yeah. You should def try it – you’d like it!! Ehhh, don’t feel guilty about missing runs, you can always run! It’s nice to take a break every once in a while. You were the highlight of my week…TWICE! Very cool. Can’t wait to meet up again soon! I see you really got in your workouts. I was up and down last week. I didn’t put in as many miles or lift as many weights as I should have so I definitely need to make up for it this week. I’m used to working out 5 to 6 days a week so this is totally not like me. I need to find my way back to bare. I really enjoyed. You definitely deserve the rest and that is when the muscles grow so make sure you get enough of it. Keep beasting! Looks like you got in some good workouts, even if they weren’t all running related! I’ve always thought the Cherry Blossom 10 miler would be such a beautiful race! Ahhhhh, I wish I was there to run with your DC Oiselle trail group. That would be my dream come true! Yo Momma Runs recently posted…What’s for dinner? Potato bombs! Before I became a runner, I worked out at the gym 5 days a week (we had one in my office building). I mixed things up between elliptical, bikes, treadmill, and weights. I was in amazing shape. I think sometimes as runners we forget that we don’t always have to run. Sounds like you had a good week. Good point – thanks for the reminder!! Your posts make me really curious about barre classes. There is a barre studio about 20 minutes away from me – maybe I’ll have to stop in! I saw someone else post about the solidcore class…I wish there was a core class available at my gym because I’m horrible at doing abs on my own. I hate it! Training went well for me. Got in nearly everything I had planned so I’m pumped about that. You’re on a great roll with pure barre. I’m hoping to try it this summer. Wow, that is a lot of Pure Barre! I tried that twice when I was on an extended business trip. Those were tough workouts! That core strength will help your running form. Good week, despite the missed runs. Keep it in perspective – you were active and strengthening muscles! Kelli recently posted…I’m Going Streaking! Wow, busy week! Sounds like a good one though 🙂 Pure Barre is no joke. Do you think it’s been helping your running a lot? You know, I do. I’m stronger, my posture is better and I’m learning how to really engage my core! This is the second post I’ve seen with the mention of Solidcore. Is that a Pilates studio?Even though you didn’t get in as much running it sounds like you got in a ton of great movement! Sandra Laflamme recently posted…The Truth behind the “All Natural” Label. What does it really mean?